A harsh winter can cause a number of issues for your roof so staying on top of roof maintenance is important. Heavy duty snow and ice build up will slowly see roof layers beginning to erode, in which gaps and holes will develop. As roofs are exposed to the natural elements 365 days a year, they require regular maintenance to ensure they stay in top notch condition. Whether you’re at home or on a work site, poor maintenance can increase the chances of people being injured so it is important to regularly inspect your roof to identify any developing issues. The accumulation of Heavy Duty Snow: Thick layers of snow, built up over time, can potentially cause structural damage and in some cases cause roof collapses. This tends to happen on older properties and worn structures that have had their fair share of wear and tear. It is imperative that you assess the current state of your roof for your own safety. The risk of Injury: There have been many cases where unexpected injuries have occurred as a result of poor roof maintenance, even deaths. It is crucial that you know the correct procedures to clearing snow off your roof. As simple as it sounds, there have been times where people have been chopping ice, which can damage shingles and gutters. 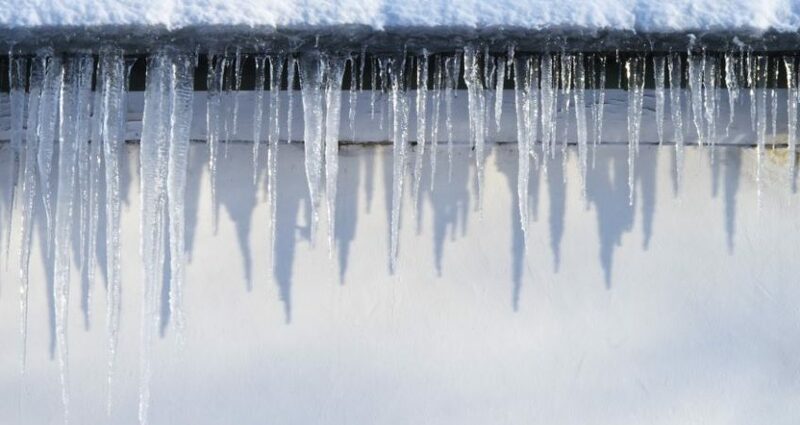 Pushing snow off roofs onto gutters can later lead to potential cracks and leakage problems. Roofs with skylights are highly exposed in bad winter periods, especially when it’s snowing heavy. The pressure of setting snow and ice can lead to leaks and even shattered glass. It is of the utmost importance that your roof is installed and sealed correctly and that skylights are kept clear. Falling snow will pretty much get any and everything that is exposed to the outdoors. Vents, in particular, need to be kept clear at all times. Blocked and clogged vents can lead to poor drainage, lingering sewage smells and even explosion risks depending on the building. Therefore it is important to start this maintenance as soon as the cold weather hits to prevent a slow build up and blockage. At Sage BEC (formerly Sage Roofing), we specialise in roof installation and ensure every project is planned and installed correctly. Our highly skilled and experienced team would be happy to help you prepare for the winter, whether you’re looking for a new roof design or a complete refurbishment. Why not give us a call or send us an email.